Whether you’re a hobbyist looking to see if a step up to a DSLR is the right move for them or a pro needing an piece of gear for a shoot, Boston Photo Rental offers the best value for people needing to rent a Canon camera. Contact us today to reserve a camera and arrange pickup or delivery! 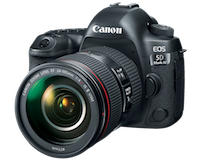 Canon 5D Mark IV The EOS 5D Mark IV camera builds on the powerful legacy of the 5D series, offering amazing refinements in image quality, performance and versatility. Wedding and portrait photographers, nature and landscape shooters, as well as creative videographers will appreciate the brilliance and power that the EOS 5D Mark IV delivers. Superb image quality is achieved with Canon's all-new 30.4 Megapixel full-frame sensor, and highly-detailed 4K video is captured with ease. Focus accuracy has been improved with a refined 61-point AF system and Canon's revolutionary Dual Pixel CMOS AF for quick, smooth AF for both video and Live View shooting. Fast operation is enhanced with Canon's DIGIC 6+ Image Processor, which provides continuous shooting at up to 7.0 fps. Built-in Wi-Fi®, GPS and an easy-to-navigate touch-panel LCD allow the camera to become an extension of you. When quality matters, the EOS 5D Mark IV helps deliver results to inspire even the most discerning imagemaker. 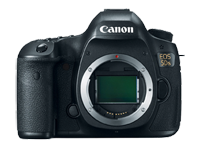 Canon 5DS Marking a new standard in high-resolution digital SLR photography, the Canon EOS 5DS camera shatters the status quo with a new 50.6 Megapixel, full-frame CMOS sensor. Perfect for commercial and fine art photography, or any other application that calls for extremely high-resolution, the EOS 5DS is the ultimate combination of EOS performance and ultra-high megapixel capture. It features an advanced, 61-point High Density Reticular AF system that includes 41 cross-type AF points and EOS iTR AF for precise AF in numerous situations. An anti-flicker function helps provide consistent exposure and color during continuous shooting under certain lighting conditions, while a built-in bulb timer and intervalometer expands creative opportunities without the need for an additional remote control. A refined mirror control mechanism reduces vibration and a Time Release Lag setting minimizes camera shake for sharp image capture when using mirror lock-up. New features like a crop function of 1.3x and 1.6x and a Custom Quick Control screen are complemented by advanced, multi-featured Full HD Movie capture, with Time Lapse Movie, and much more. 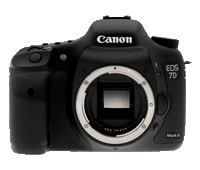 When Canon upgraded their 7D camera, they went above and beyond anyone's expectations. The EOS 7D Mark II’s 20.2 Megapixel sensor works seamlessly with a pair of DIGIC 6 Image Processors for supercharged processing across the board. These Dual DIGIC 6 Image Processors help the EOS 7D Mark II capture up to 1090 JPEG/LARGE, 31 RAW, and 19 RAW+JPEG shots in a single burst for detailed action photography at up to 10 frames per second. The processors also enable the camera’s powerful image processing on-the-fly: lens aberration, variances in peripheral illumination, and image distortion can all be corrected in real time. Additionally, the 65-point All Cross-type autofocus ensures precise autofocus no matter the subject or the camera's orientation. Optimized for low-light shooting, the EOS 7D Mark II’s sensor captures images at up to ISO 16000, making it perfect for event photography. Canon Rebel T5 kit with 18-55mm lens. 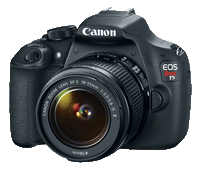 The Canon Rebel T5 is perfect for families, budding photo enthusiasts and first-time SLR users alike. This user-friendly camera makes it easy to capture movies and photos that are nothing short of dazzling. With a powerful 18.0 Megapixel CMOS (APS-C) image sensor and Canon’s DIGIC 4 Image Processor for easy recording of HD video and high-resolution photos and has a huge 3.0-inch LCD screen for Live View recording and review. With a 63-zone, Dual-layer metering system, an expanded ISO range for outstanding operation in less-than-perfect light, shooting modes like Scene Intelligent Auto to take the guesswork out of complex shots plus creative options like Canon's Basic+ function and Creative Auto, the EOS Rebel T5 is ready for anything. Want more details about renting a Canon camera from us? Visit our FAQ!